The Movie Studio is a Civic Trophy Reward Building that serves as an icon of good overall Residential management and growth in your city. 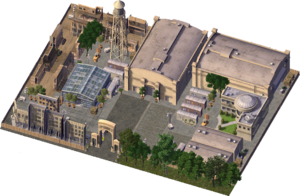 The Movie Studio is one of the cheapest rewards in SimCity 4 Rush Hour/Deluxe, being completely free, however constructing it should be considered akin to taking out a business deal: It uses a lot of land which may be required in a city of 110,000+ Residents, it has a reasonable drain on resources, little actual benefit and a massive demolition cost. This page was last modified on 21 January 2014, at 14:27.